Heading to a big model show in Toronto next Saturday so hoping to pick one of these up cheap. They're $150 at the shops here in town. Yep, $150 for a 1:48 Tomcat, is just a bit insane. 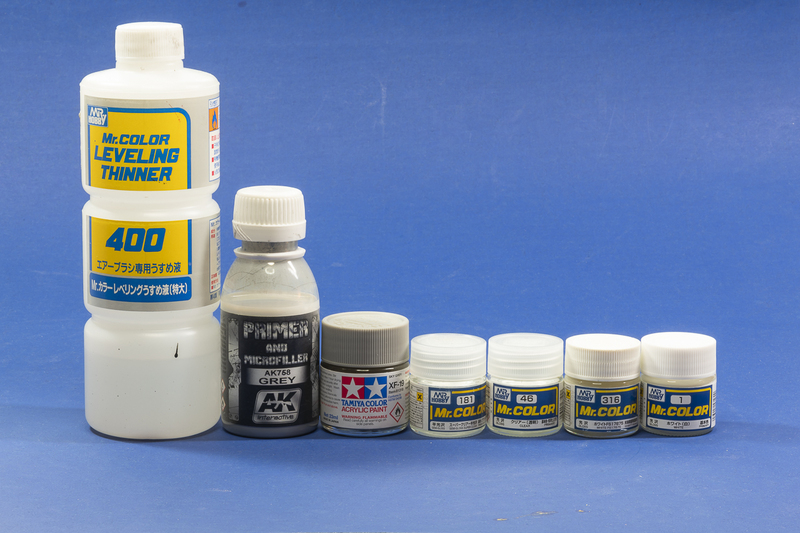 I know it's insane works out to $118 US the 1/32 Tamiya P-51's and Corsairs range from $180 to $210 Can. here in London. The Kittyhawk Kingfisher is $120. Seems Tamiya kits cost a wee bit more up north of the boarder. Many non-US countries seem to get gouged on prices. I have no idea what that's about. Yep we get boned on Tamiya prices I can buy 6 1/48 Airfix P-51D's for the price of the Tamiya D/K kit. I hate to say it, but better you guys than me. I have a hard enough time justifying kits as it is. Hey Petter, been away from the forum for a while but just caught your build and Wow buddy, that Tomcat looks Awsome. I am glad you have some of your Modeling Mojo back. Mine has been up and down alot lately to and I haven't posted much of anything in a while but hope to have some new stuff up soon. Great work on the model and will be watching the finale soon. Take care my friend. I suffered a good year with the modeling juices and mojo here one day and gone the next. I started a good number of kits, only to loose interest and and put on hold. The Tomcat, near and dear changed all that and now I look forward to my bench time with great anticipation. My advice is to try something different and nothing could be better then Tamiya for ease and zero roadblocks. Doesn't have to be an aircraft, anything that gets the juices going. Very much appreciate the kind words on the Big Cat - just a pleasure to work on. With the fuselage decaling nearly done and detail painting up next, I decided to take a break and build and finish the missiles, drop tanks and pylons. 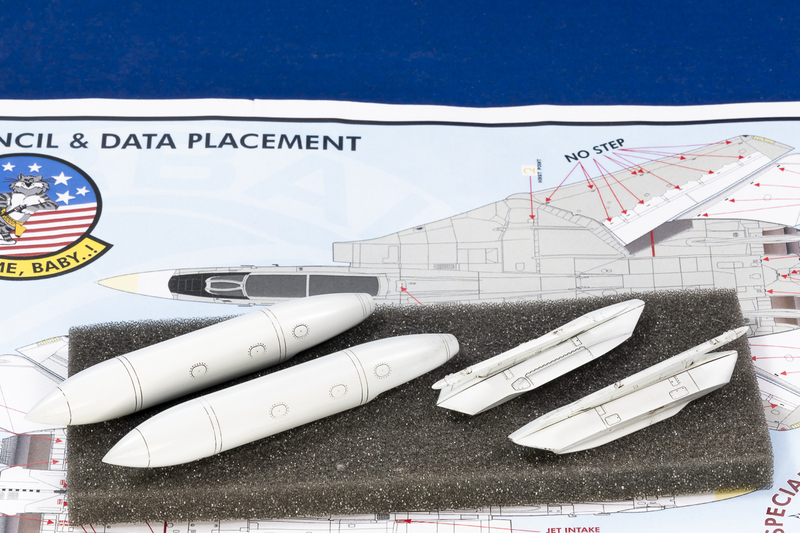 Assembly is straight forward, no problems but care needs to be taken as there are various parts for the Sidewinders and Sparrows that are intended for the F-14D when released this year. Of course, rushing, I blotched one sidewinder and had to perform a bit of emergency surgery to correct my mild blunder. The two pylons fall together and are very nicely detailed in their own right. One night was needed to build all the assemblies and one additional night was needed to clean up the parts and then it was off to the spray booth. Lately I've been using AK Gray Microfiller and Primer and shot straight from the bottle: 25 drops plus 4-6 drops of Gunze Mild Retarder to keep it wet and let the primer flow on the surface. I normally apply the primer with an Iwata Revolution CR .5 tip for a nice wide and even spray pattern while being about 1.5-2 inches from the model surface. After the primer was applied, I let it dry over night and prior to the color coats, I always check the surface to see if any polishing would be needed â€“ smooth as silk and none needed. 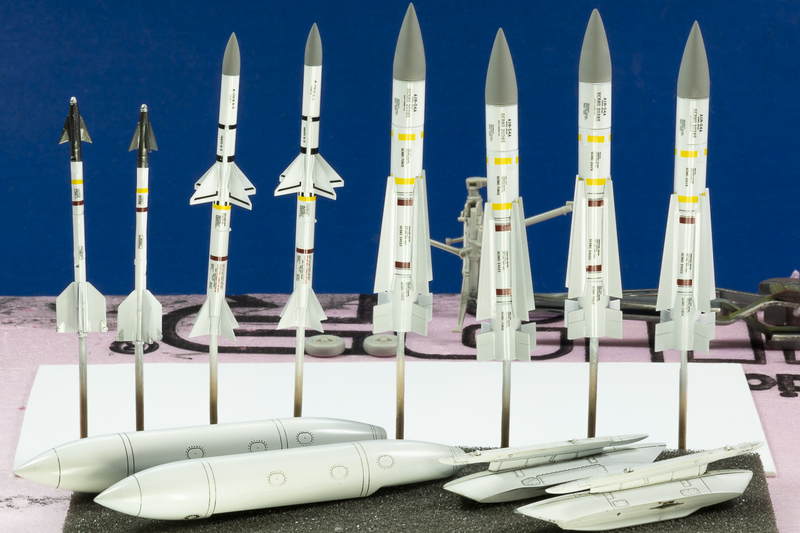 The drop tanks and pylons were painted with Gunze FS17875 Gloss Insignia White (matching the Tomcat's white) and the Phoenix, Sparrows and Sidwinders were painted with Gunze Gloss White. Color coats were applied with an Iwata Eclipse HP-CS with a .35 tip, looking for a wider spray pattern then my usual weapon of choice: H&S Infinity CR Plus with a .2 tip. The wider the tip, the wider the spray pattern can be without pulling away from the model surface, which will prevent the lacquer from starting to dry before reaching the model surface and won't self level correctly. I thin Mr Color paints: 25 drops paint; 25 drops of Gunze Self Leveling Thinner and 4-6 drops of Gunze Mild Retarder. When shooting Gunze lacquers a spray booth is an absolute must or a good respirator â€“ I always use my spray booth for paint sessions that are longer then a few minutes, which also prevents the smell from permeating the house. Normal procedure is a light mist coat, then I start to build up a few wet layers, insuring the paint flows on and looks wet. I always let gloss colors dry full 24 hours to be on the safe side. The noses cones for the Phoenix and Sparrows were masked and painted with Tamiya XF-19 Sky Gray as per the instructions and the Sidewinders Tamiya X-10 Gun Metal. The missiles surfaces dried diamond silk smooth and required neither any polishing or a clear gloss coat for decaling with the kit's decals: they slid around like us old guys walking on ice! The panel lines and details were picked put with Flory Dark Dirt and wiped off with no problems at all. A bit of tweaking is needed and then everything will be sealed with Gunze Semi Clear Gloss. Next up the gear and then back to the fuselage. Wow Peter, they look awesome. Well done man!!! !